Most of us have been in its grip before — the alarm goes off, our mind starts whirring away, and before we know it, we’ve done a freefall into worry. Neuroscientist Lisa Feldman Barrett has been there, too, and she tells us how we can stop the spiral. OK, you may not have the dog, the kids or the meeting across town, but what about the rest — the cascading catalog of to-dos, the sinking feeling that you’re behind even before your day has started, and the headlong tumble into despair? According to Barrett, those last two sentences of the above scenario — the “Oh my God. What is wrong with my life?” part — are especially treacherous. Why? Because too often we come to the sweeping and inaccurate conclusion that our life stinks. But we don’t have to take this misery lying down, says Barrett. 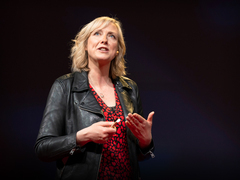 Through her research at the Affective Science Laboratory at Northeastern University in Boston, she has come to some mind-shaking realizations about human emotions. Contrary to what many of us think, our emotions are neither hard-wired into our brains nor are they out of our control. Instead, our emotions are guesses that our brains generate on the fly, based upon our past experiences.